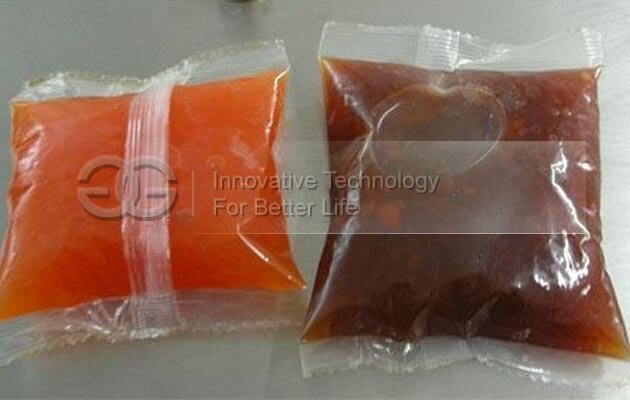 Suitable for automatic packing of chilli sauce, skin lotion, cosmetic cream, fruit jam,edible oil, etc..
Can finish conveying bag, bag making, filling, weighing, sealing, cutting, counting, lot number, etc. 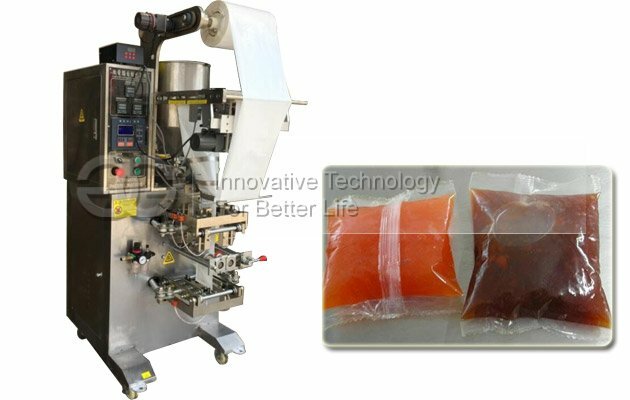 This automatic chili sauce packing machine uses volume method of pneumatic plunger pump to measure the material of the products. The packaging machine can pack different weight materials. Bag length can be adjustable, when it comes to packing specifications, a variety of packaging bags wide timing, can according to the packaging specification and weight, to purchase multiple sets of different packaging specifications of the molding machine, pump with different material. 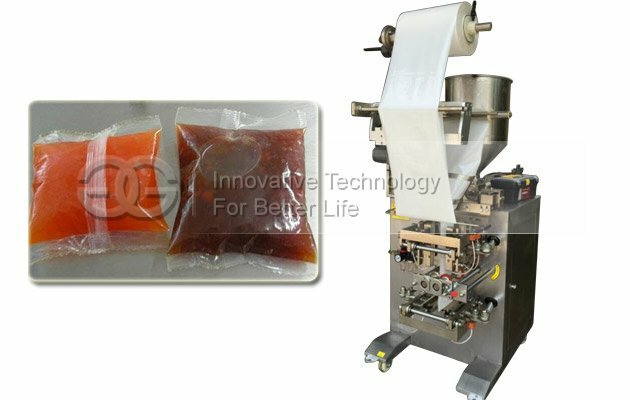 This automatic sauce packing machine is suitable for all kinds of bean paste, sauce, seasoning, oil, etc., such as bake edible sauce, hot pot seasoning sauce, salad sauce, fruit granule jam, edible fruit jam, bakery jam, peanut butter, MaLaJiang, tomato sauce, etc., are widely used in food industry, all kinds of seasoning spices industry, as well as chemical, agrochemical, and many other industries. 1) Be able to weight, bag-making, filling, sealing, cutting, lot number automatically. 2) It has color control system which can get the complete trade mark design(Photo electricity control system). 8) With printer (to be able to code the date and batch number) and rotating blade (be able to adjust the length of bag and shape of bag notch edge packing.